Examples demonstrate how our team can restore your damaged pieces back to their original beauty! A client brought in a rather unique mixed media art piece that had a broken “twig” leg. It is made of twigs, wood, and paper-Mache’. The leg was missing so I had to carve a new leg to look like the original “twig” and incorporate it into the art piece. I then had to replicate the colors and brush strokes of the original artist so that it all blended into together. This is how the table was before I began work on it…severe damage to all six legs and to top. Antique drop leaf table after repairing four badly broken legs, six broken stretchers, and repair and refinishing burl top. Wonderful old toy and keepsake - Badly damaged! Just look what we did! 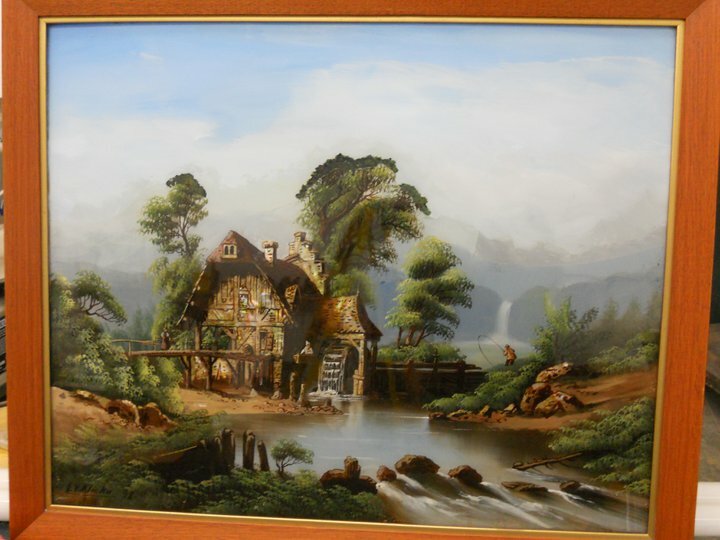 Badly damaged vintage reverse oil painting that had badly deteriorated sky, restored to beauty! Tiffany reproduction table lamp for replacement of art glass panes in the front panel and repairs to broken leg. Not rare or expensive but still in need or repair. This is a hand carved Italian Renaissance Rococo Style 18th Century reproduction wall mirror measuring 54.5” x 88.5”. The top 12" of this highly carved frame was missing completely. A new section had to be hand carved from a block of Tulip wood to match the existing carvings in the frame, grafted to the frame, finished, and glazed to match. Authentic Chippendale mahogany armchair with knuckle arm terminals, Philadelphia, circa 1760-1780. The back elements were shattered and split in approximately 12 places. Several pieces of the chair back were missing and new ones had to be carved, grafted, stained and finished to match. 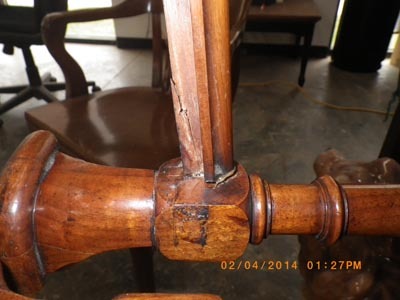 The lower third of the front left serpentine leg on this vintage Dining Room chair was snapped off and lost during the chair owner’s move. A new leg part was carved from Mahogany and grafted to the stump of the original leg. The new leg part was then stained, finished and distressed to match the rest of the chair. The end cap on this footboard of a king bed was snapped off. A new part was created, grafted, and finished to match the rest of the bed. This ”Hazelton” Upright Spinet piano, manufactured by Kohler & Campbell in 1972, suffered extensive damage and was picked up as a pile of parts from the shipper's garage. The legs were broken off of the piano case, there were numerous dents, gouges, and scrapes in the finish and broken casework. This vintage enameled porcelain lamp had a broken neck and a large chip of porcelain missing from the neck. The lamp was repaired with a catalyzed epoxy and re-enameled and then re-lacquered. This is a 65-year-old family heirloom. The chest was water damaged and had many areas of broken and missing veneer and numerous gouges through the wood into the substrate. The client also requested a color change to better showcase the beautiful grain of the Walnut. The decorative carved elements were glazed to accentuate them by creating additional contrast. This vintage Mahogany mirror, which attaches to a triple dresser, had the lower left decorative corner elements broken off and some pieces missing. The broken piece was fitted and glued into its proper place and the missing parts replaced. This is a Baker sideboard that had suffered a deep cross-grain scratch through the lacquer and into the underlying veneer work. The top was stripped, the gouges repaired, and the top finished to match the original color and sheen. This decoy is part of the owner’s decoy collection. Not only was the left wing of the duck broken off of the body, but there was some wormhole damage that had been with the duck for some time. The wing and wormholes were repaired. The necessary patches were carved with new feathers and graining to match the original. This large Teak wall unit had several pieces of veneer missing. The unit was repaired on-site. This china hutch is Mahogany and many pieces of the delicate arched mullions or “window panes” had been broken and lost. The piece arrived in the shop and new curved mullion parts were fabricated, installed, and finished to match. This is a gate leg, Pembroke style table. The table top has been broken in half length-wise and was also torn loose from the rest of the table. The broken table top was re-joined with 10 biscuits and reattached to the table base. The finish on the top then had to be restored. This painting, purchased from the Philadelphia Museum of Art around 1970 suffered a puncture through the canvas and a fair amount of scraped paint around the puncture. The canvas was patched and the gouges and scrapes in the paint and canvas were filled and the color replaced and sealed. The end panel on the desk return had been completely broken out and the veneer severely damaged. A new end panel was designed and built. New veneer was carefully selected to match the original grain pattern and was finished to match the original desk parts. 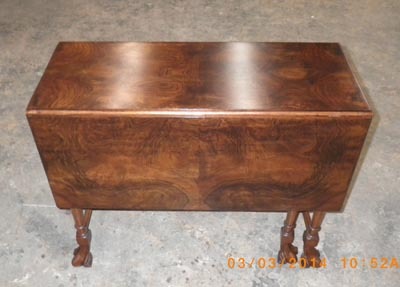 This shows the completed desk return. Notice the base is damaged, coming completely detached. 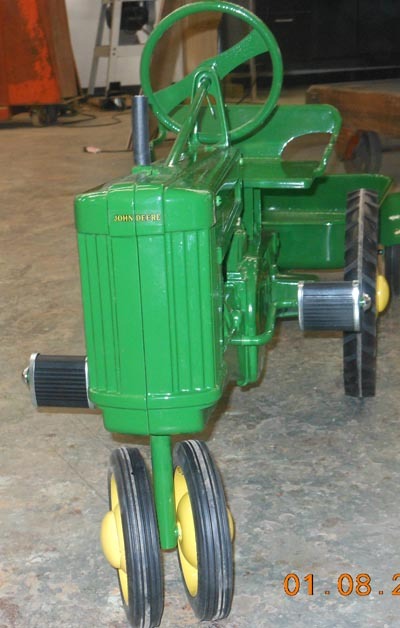 We restore this beautiful item.